At Splitcoaststampers the Inspiration Challenge is about our forgotten favourites. I have so many it is hard to keep track. One who always inspires me is Loll Thompson from happylittlestampers. She does the most wonderful backgrounds ever. So I concentrated on my background for this birthday card for a friend whose birthday is in December. She keeps my cards up for a long time, so I wanted to make sure it would look nice through Christmas too, and no, not to worry, she does not follow my blog. I did the background using Viva Decor Inks. As I have mentioned before, they are like a wax, and the outcome is always wonderful. I mixed the Steelblue, Jade and Platinum colours together on my craft sheet keeping them dry and used used a sea sponge to apply to the mixed media paper, which I had spritzed slightly with water to help the wax move around easily. 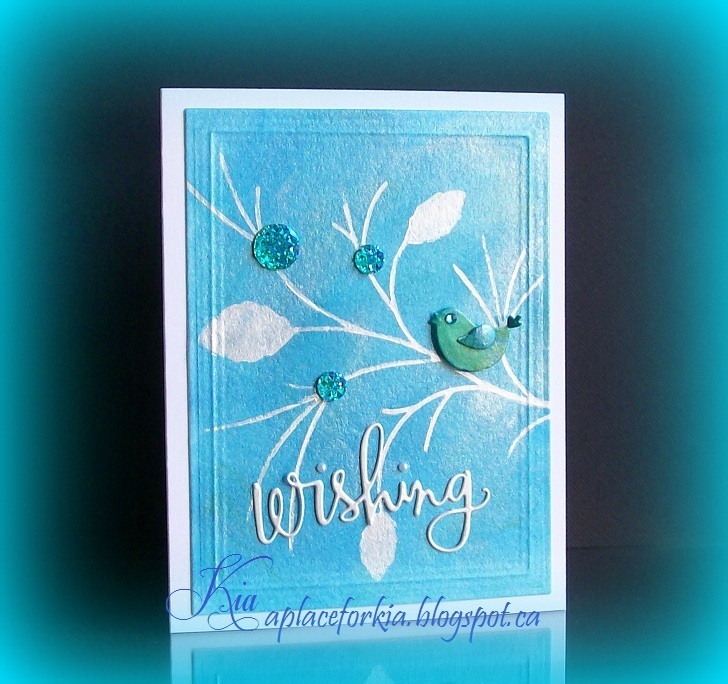 I stenciled using the Platinum then used the Jade and Steelblue for the Bird, which is styled and on foam dots, and used the Platinum for the sentiment. I added some pearls to dot the "i" and a crystal gem for the birds eye. I also added some larger Prima Crystals. The framing is done using the Spellbinders Card Creator Matting Basic Dies. Thanks for having a peek. Products: Spellbinders Card Creator A2 Matting Basics B, Memory Box Whimsy Branch Stencil, Impression Obsession Bird from Love Birds, Simon Says Stamp Wishing sentiment die, Prima Crystals, Kaiser Pearls and Gems. Oh, Kia, I so love Loll's work too, and what a beautiful CASE of her work. I adore your amazing and beautiful background, and you use dies making some of the most elegant cards. This is stunning, and I LOVE the color!! Hugs, sweet friend!